Overcome by spring, buoyant Mrs. Toggle races off to the playground, where she accidentally sends her blue shoe flying into a tree. Now the whole class must team up with Mrs. Toggle, Mr. Stickler (the principal), Mrs. Burns (the cafeteria cook), and Mr. Abel (the custodian), in order to rescue the shoe from its dangerously high perch. 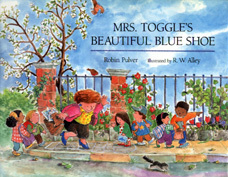 Will Mrs. Toggle ever have her beautiful blue shoe back on her foot where it belongs? Woven into this silly story are the differences between living and non-living things (from a list my son brought home from school one day). Mrs. Toggle says, "Mr. Stickler, I hate to say it, but you are being ridiculous! My shoe cannot move by itself, and I have never known it to be hungry!"